If wolves are delisted by this rider, there is nothing to stop the Great Lakes from returning to the aggressive state management plans and broad wolf hunting seasons that existed in 2012-2014, resulting in the death of 1521 wolves in two years, nearly half of the population. Losing wolves at this dangerous rate would diminish the economic profits from outdoor recreationists in MN, WI and MI, weaken already fragile wolf populations, and destabilize the ecosystem as a whole. The passing of two state referendums in MI, and a 2014 survey by the Wisconsin Department of Natural Resources shows that the public does not support the hunting of wolves, and value the important ecological and economic role that wolves play. Having enough wolves on the landscape to fulfill their biological role in the Western Great Lakes makes good financial sense. Wolves provide crucial economic and tourism dollars, especially as the revenue generated by hunting drastically declines due to lack of public interest in the pastime. Wolves also provide important ecological benefits which cost millions when Governments attempt to take them on, chronic wasting disease is an example. Studies show that wolves act as a firewall against the spread of chronic wasting disease, which has had a devastating economic impact in nearly all counties of Wisconsin. In 2001 – 2006 the Wisconsin Department of Natural Resources spent $26.8 million in attempts to manage CWD outbreaks, efforts which the Wisconsin government admits have not been effective. Wolves effectively reduce densities of wild white-tailed deer, which in turn protects commercial forestry operations and agriculture crops by reducing overbrowsing. In 2015, Wisconsin Department of Natural Resource spent $754,592 on their damage abatement program for white-tailed deer, a job which wolves do for free. By reducing deer densities wolves also help to mitigate the risk of vehicle-deer collisions In 2015, Minnesota experienced 2,141 deer related collisions, at a National average of $3,995 in claims per collision, not to mention lives lost, Minnesota has much to gain by protecting their wolf population. In short, wolves can benefit agriculture, tourism, public safety, forest and water quality, and ecosystem health. Wolves are a strong lure for tourists at Isle Royale National Park, in the Boundary Waters region of Minnesota, Voyageurs National Park and in the Upper Peninsula of Michigan and northern Wisconsin. There are thousands of tourists who relish the idea of spotting a wild wolf or just want to feel the effects of an intact, wild ecosystem by walking in habitats that wolves also use. A true symbol of wilderness, wolves bring tourists who in turn bring economic activity to rural regions, regions devastated by loss of jobs. Livestock guardian dogs and fences are more than 99% effective and also add to reducing livestock losses of 102 million dollars per year, mostly by coyote and bear. By allowing for a near repeated historical extinction of wolves in Wisconsin, in which hunting actually increases livestock losses, these breeders and ethical producers stand to lose a lot financially too. And if producers aren’t using non-lethal abatement for wolves, we will lose grants for farmers. You can expect that these farmers, willing to work with nature, will have more losses. And not just by wolves. The science, the public and the money all point to the fact that wolves are a valuable resource for our ecosystems and our economies. The total value of wolves in incalculable, but their presence saves local governments millions by managing overabundant deer and their negative economic impacts, and at the same time, drives significant income and jobs in tourism, particularly in rural areas where they are sorely needed. Lawmakers should not cripple The Great Lakes and their potential for real economic prosperity by legislatively delisting wolves. Please take action to oppose this legislative delisting here. The citizens of Michigan spoke loud and clear at the ballot when voters soundly defeated wolf hunting referendums twice. 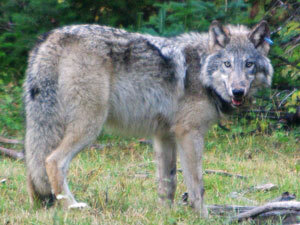 The public does not want wolves delisted in the Great Lakes region!!! !